The Sunday Talk - Merry Christmas Everybody! Posted byOmi Sido 24th December 2017 21st June 2018 Leave a comment on The Sunday Talk – Merry Christmas Everybody! Monday morning and I am going to a one-day course on Google Analytics. For those of you who texted me after The Sunday Talk, yes, as an SEO I do Google Analytics. In fact, I think I know it pretty well. But given a learning opportunity, I never say ‘No’ as I never ever think that I know everything in a given subject. To achieve excellence one must always strive to learn more and to do better. When it comes to Christmas Oxford Street is my favourite place here in central London. meanwhile, I am just coming back from the Sistrix training and it was amazing. Patrick gave us so much knowledge. Hey Juan, thank you very much for setting me up with this training, mate and Merry Christmas. Saturday morning. Everything around me is frozen. But the day has arrived. I am finally moving into my new house. My old house is here. a house in a car. I’ve spent all my money buying the house so buying a cooker or fridge…buying food this Christmas will be very, very difficult. But then I am alive again. You out some coffee inside. You pour over some hot boiling water. Two sugar and you wait for a process called sedimentation. Then you imagine that it tastes good and you drink. Mamma mia. Bellissimo. The things that you find in old houses. A newspaper from 1981. And Tony Galvin: I never realised Spurs was such a big club. I am sorry to tell you that Tony but 36 years later Tottenham is still not there. James, nobody, nobody ever asked me about Christmas SEO. Ok, but if I have to give you 3 tips. Ok. The first one would be ‘Add a Christmas logo to your website’. If nothing else it shows that your website is current, and up to date. The second one would be – and ok not many people do it – ‘Update your meta descriptions to be seasonal. Attract the clicks in the SERPs by standing out and being relevant. Yeah, I talk a lot about relevance. By the way, you need to do this sooner rather than later. Ok? As it could take Google a while to update. But don’t forget to change back once the holiday season is over! Last but not least ‘Email past buyers’. Yes, trust me on this one. Last minute shoppers are often ‘repeat offenders’ so gather a list of those who purchased last minute last year, yes, and surprise them with a tailored email campaign which will help them again this year! How do I always come up with ideas like that? Well, you know me, James. Patricia Martinez: Merry Christmas, guys! And do come back here next year. 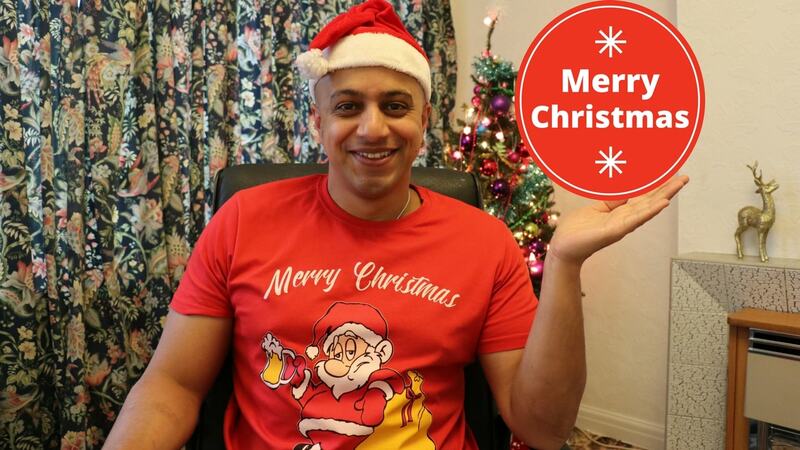 Sunny Karwal: Merry Christmas, guys! Don’t forget to come back here next year. And have a great one. Cheers. Alex Thurgood and Stephen Casey: Merry Christmas everybody. Don’t forget to come back here next year. Ibukub Sodipe and Esha Nandi: Merry Christmas, everyone! And don’t forget to come back here next year. Sandra Lokas: Merry Christmas everybody! And don’t forget to come here next year. Samar Mustafa: Merry Christmas, everybody! And don’t forget to come here again. Cecilia Montessoro and Karla Al-Hassan: Merry Christmas everyone! And don’t forget to come back here. It’s Christmas Eve people! It’s Christmas Eve and let me tell you something. Christmas is a miracle. On this day of the year, all of us smile a little bit more, give a little bit more. Love a little bit more. And let me tell you something else. Christmas is the time to be the best version of yourselves. Cause you never know you may like it and you may continue doing it. So then this miracle will be with you throughout the whole year. Meanwhile, I hope I managed to inspire you a little bit this year and if I made you smile once, just once please do come back here next year cause you’ve got the problems and I’ve got the solutions.